Each issue of Cheeky Weekly commenced with the toothy funster's doings on Sunday, then progressed through the week, culminating in the following Saturday. Thus, as we progress towards the back of the comic in this series examining the contents of each page throughout the comic's run, we find ourselves considering the latter portion of the week. Since Cheeky had a regular appointment at the Saturday morning picture show, it's not surprising that we encounter an element of the picture show sequence on page 28 of Cheeky Weekly's first edition, namely the second page of Wile E Coyote's adventure which was that issue's strip representing the animated cartoon element of the big screen programme. The following week the Interval component of the picture show sequence came to rest on page 28, but 7 days later an 8-week run on page 28 of Space Family Robinson, the adventure serial element of the show, commenced. This run was ended in the 31 December 1977 Christmas issue when Bam Splat and Blooie shared page 28 with and ad for IPC's soccer title, Shoot! Sci-Fi thrills then resumed as Space Family Robinson enjoyed a further 4 week sojourn in the subject location, after which Interval moved back in for 2 issues. 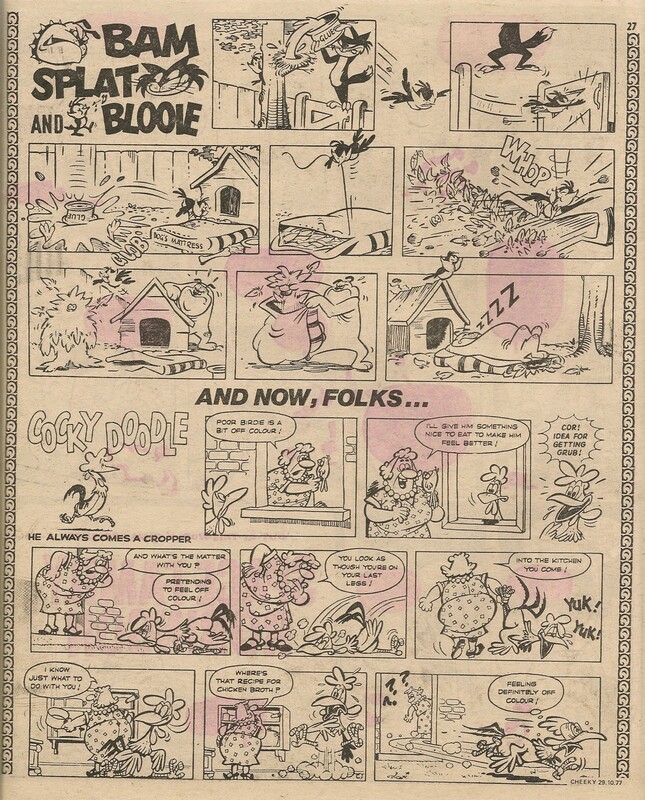 The 04 February 1978 edition saw Bam Splat and Blooie sharing page 28 with a half page Interval. Interval expanded to its usual full page the following issue, after which Space Family Robinson returned for what was to be their final page 28 outing. The Robinsons' alien-planet-ordeal occupied page 28 on 13 occasions making them the third most frequent occupants. Interval then resumed for 18 issues, interrupted for 2 weeks by Tweety and Sylvester. In the comic dated 15 July 1978, Interval began a 4-week run, after which the debut Cheeky Weekly appearance of Archie's Angels came to rest on page 28. However, the intrepid air display teams's tenure of the subject location was to prove brief, as Interval then commenced a 6 issue residency which proved to be the final Interval run in that location, bringing to 31 the total times the feature appeared on page 28 and making it the most regular occupant. In the 30 September 1978 comic it was the fearsomely-fanged-predator-versus-geriatric-protagonist shenanigans of Who's Afraid of The Big Bad Wolf? that acted as the animated cartoon, but Tweety and Sylvester provided the same function a week later, with Ghouldilocks doing the same thing in her own spectral fashion in the following issue. In honour of Cheeky Weekly's first birthday, the 14 October 1978 edition saw a special one-off Interval element, Hey Presto! Magic Show, occupy page 28, but the furious bird-and-cat feuding of Tweety and Sylvester then returned to the site under review for 5 weeks. The first of the truncated issues, dated 02 December 1978, resulted in page 28 being the back cover and thus Saturday (featuring the last of the Cheeky's Pal Puzzles) being the occupant, while the back page of the second 28-page issue a week later was home to a Pin-Up Pal poster of Flash Harry. Cheeky Weekly was then absent from newsagents for 3 weeks, returning with an issue dated 06 January 1979, in which the Chit-Chat letters page made its first appearance on page 28, remaining in that location for a further 12 issues until ousted by Saturday. However, Chit-Chat moved back in a week later, this time clocking up a 9-week run. Page 28 in the 16 June 1979 edition hosted a competition entitled Who Is The Alpha Man?, inviting readers who had been following the nefarious deeds of the aforementioned letter-loving criminal to submit their guesses as to the identity of the titular felon, whose story had come to a conclusion on the preceding page. Sharing page 28 with this competition was a half-page ad placed by Dunlop, who were promoting their line of Playsport outdoor games with a nice drawing by Nick Baker (of Smiler fame) depicting a bunch of kids and parents working themselves into a frenzy of summer, back-garden fun while using a selection of the products on offer. Chit-Chat moved back for 2 weeks which concluded its appearances in the subject location and making it the second most regular page 28 occupant with a total of 24 visits. Speed Squad thundered onto page 28 a week later, their first outing in this location, but their initial sojourn was a brief one as in the next edition the showbiz antics of Stage School replaced the intrepid trio. The various blunders of Paddywack were then the subject of the location under review for 6 issues until, in the 01 September 1979 comic, Disaster Des made his sole visit, after which Mustapha Million enjoyed a similarly unique outing. Paddywack then returned for 2 weeks, and then Why, Dad, Why? turned up for a week. The reprinted telephonic tribulations of Ringer Dinger made their Cheeky Weekly debut 7 days later, but then Why, Dad, Why? returned. The following week an ad drawn by Brian Bolland depicting selections from Palitoy's Star Wars range occupied page 28 but 7 days later Cheeky's Friday doings were the subject of the page. Paddywack then made a final foray on to the location under review, after which Speed Squad moved back in for 9 issues, in the 15 December 1979 comic sharing the page with a row of vintage Mike Lacey single-panel gags, a filler that was entitled Cheeky Chuckles. A one-off filler feature focusing on the health regime of Krazy Town's fitness fanatic failure, Jogging Jeremy's Weakly Exercise Routine, then shared the page with ad an for IPC's veteran sport-oriented title Tiger, alerting prospective readers to the imminent commencement of a 1980 Winter Olympics booklet within its pages. Speed Squad's high-velocity escapades were the subject of page 28 in the final 2 issues of Cheeky Weekly, and they were the third most regular visitors to the site under review with 11 of their strips zooming through. 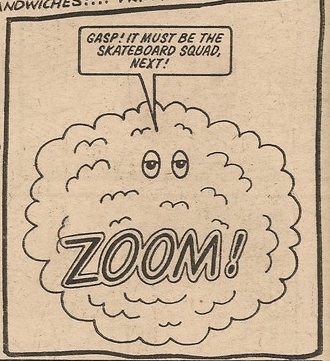 The strips featuring the intrepid trio who constituted the Skateboard Squad (later restyled, as they embraced more varied modes of transport, Speed Squad) were, like all of the non-Cheeky features in Cheeky Weekly's golden era, framed by the toothy funster's pages. 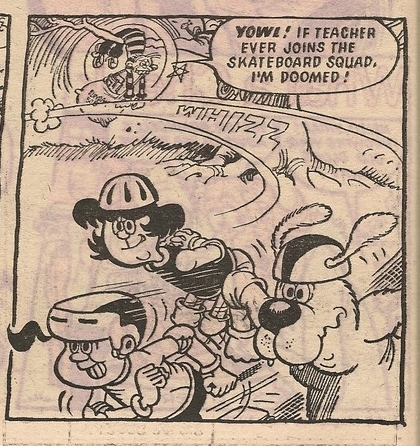 In the case of the Squad, the members of the team – Skatie (female), Skipper (male) and Wipe-Out (canine) - were introduced by Cheeky in the final panel of the Cheeky's Week page preceding their adventure, regularly bowling our grinning pal over as they sped to their latest escapade, although the individual Squad members were often obscured by the clouds of dust raised by their rapid passage. All but one of the first 49 Skateboard Squad episodes saw Cheeky's introductory encounter with the intrepid trio occurring in the final panel of Sunday. In the case of the 04 February 1978 skateboard issue, the intro appeared in the final panel of the front cover's Cheeky's Week strip which, by implication, took place on Sunday – there was no Sunday page that week to allow the Skateboard Squad story to expand onto a second page in celebration of the special issue. On two occasions in those first 49 stories, the terrific three failed to appear in the intro. The first such occurrence was in Cheeky Weekly's first Christmas issue, dated 31 December 1977, when Cheeky was surprised that the Squad weren't in evidence in the usual location. The explanation for their absence on the street was forthcoming in the ensuing story which began with the team unwrapping their Christmas presents (skateboards, natch) at home. 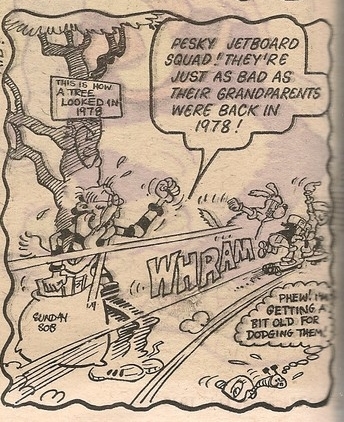 The second time Skateboard Squad didn't appear in the intro was in 19 August 1978's sixty-years-into-the-future edition when what Cheeky describes as the Squad's grandchildren, Jetboard Squad, were seen on the page before an adventure of 1978's Skateboard Squad. Subsequent to 30 September 1978's introduction of the Mystery Comic and the consequent reorganisation of Cheeky Weekly to accommodate the new central section, Skateboard Squad was shunted further back into the comic. Although displaced, the 30 September 1978 Squad episode did feature the team in an introductory panel on the preceding page, but the following 10 adventures had no intro. This cessation of intros could be seen as part of the policy to eventually end all the framing devices, yet introductions resumed in the comic dated 06 January 1979 and continued up to and including the 17 March 1979 edition. The following week there was no introduction as the page preceding the Squad's adventure was occupied by Paddywack. After this there were 4 remaining appearances by Skateboard Squad before their renaming, and all of those final 4 outings in their original guise included intros. Speed Squad made their debut in the 26 May 1979 issue, and although the revitalised team didn't actually appear on the preceding page, Cheeky was seen there loitering near the trio's shed, saying 'Now to find out what Skip, Skatie 'n' Wipe-Out have been up to for a week'. This panel would seem to be a hasty construction, featuring as it does a pasted-in Frank McDiarmid Cheeky on what is otherwise a Jimmy Hansen Tuesday set. Over the page, Speed Squad's premiere tale commenced inside the shed we had seen previously. The Speed Squad adventures in the following three comics all had intros, but it was at this point that the Squad fell victim to the framing device cull, as from the 07 July 1979 comic to that dated 15 December 1979, there was no evidence of the members of the team outside of their own strips, nor any mention of them within Cheeky's pages. suggests that it replaced the original contents. However, the canny Cheeky Weekly editor still had in his desk some unpublished Cheeky's Week pages that were originally intended for the three editions of Cheeky Weekly that failed to appear in December 1978, an interruption which occurred in those heady days when all the framing devices were in full force. Among those previously-unseen sets were 2 that featured Skateboard Squad intros, and these, after some judicious editing to replace references to Skateboard Squad with Speed Squad, were eventually published in December 1979. These final 2 forays into Cheeky's Week by the terrific trio didn't really fulfill the original intention to serve as intros, since their appearance on the Thursday page in the 22 December 1979 edition preceded the Squad strip by 8 pages, and a week later they turned up on the Sunday page despite there being no Speed Squad strip in that issue. Following the publication of those 2 held-over pages, there were no further intros to the Squad's strips. Although their likenesses are somewhat at variance with their usual depictions, the presence of a skateboarding dog makes it clear that the human 'boarders accompanying Wipe-Out, Cheeky and Snail in the instructional images featured in the All About Skateboarding booklet serialised in Cheeky Weekly in November 1977 were intended to represent the non-canine members of the Squad. 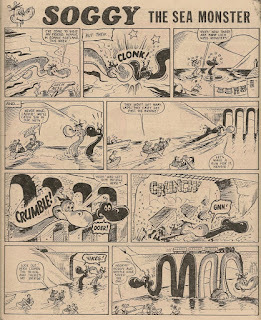 Cheeky Weekly, from its first issue, included reprints (not an unusual situation in comics of the time), but initially some imagination was used in the way those recycled strips were selected and framed within Cheeky's universe. For example Bam Splat and Blooie and Cocky Doodle, sourced from early 60s issues of IPC's mighty Buster, were used to represent the animated cartoons watched by Cheeky and his pals during their weekly outing to the Saturday morning picture show. The feature I refer to as Old Comic, showcasing even more venerable selections from IPC's inherited archive of funnies, was presented as Cheeky's choices from his dad's trunk full of comics in the loft. The James Bold stories, initially incorporated into Cheeky's universe by presenting them as a series of books read by the toothy funster (and later viewed by him on the big screen) were 'partial reprints' in that scripts written for Maxwell Hawke, again from Buster, were re-drawn for Cheeky Weekly. As mentioned before, the use of reprints was standard practice in British comics of the time and it's entirely understandable that the Cheeky Weekly editor would seek to manage his budget by resorting to past successes to economically fill out a few pages of the toothy funster's comic. The majority of readers would be unaware that they were reading strips that had been enjoyed by earlier comic fans (except, of course, in the case of Old Comic where the whole point of the feature was to make readers aware of the vintage nature of the selections). However, over time the framing devices which made each issue of the comic a cohesive narrative were dropped, and whereas formerly reprints were used in a creative way that enhanced Cheeky Weekly's unique nature, towards the end of the comic's life seemingly random old strips were brought out of retirement to cheaply fill some space in what appeared to be a more cynical fashion. was also blank when this strip was originally printed. Update: See Stephen Archer's interesting comment below. 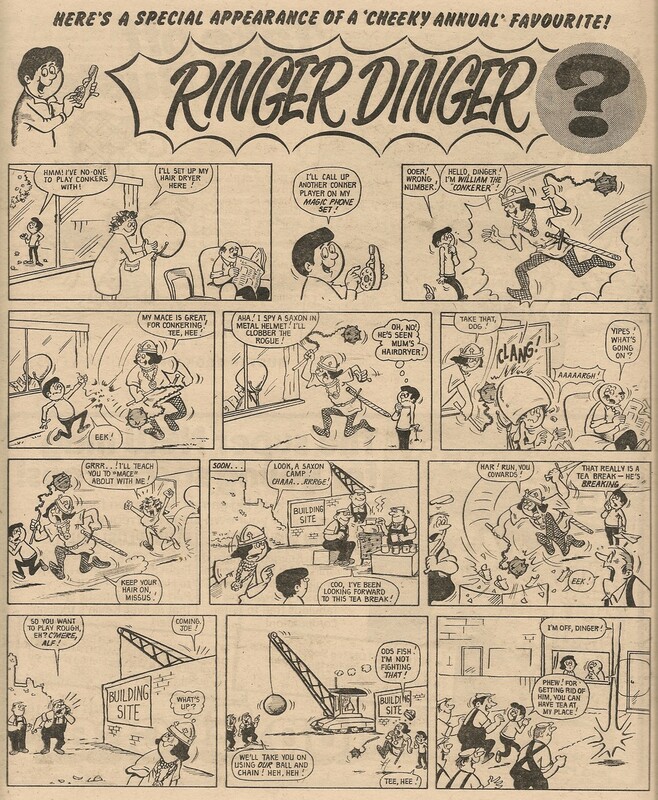 Ringer Dinger appeared in 2 further issues of Cheeky Weekly - the penultimate and final issues. One wonders why - if the telephonic tyke was such a 'favourite' as claimed in the banner above his Cheeky Weekly debut - he was absent for such a long period before his return in the final 2 issues*, being replaced in the intervening period by another reprint, this time featuring the aquatic adventures of a lovable leviathan. Soggy the Sea Monster, retrieved from the dusty archives of Shiver and Shake, enjoyed his first watery Cheeky Weekly outing in the issue dated 17 October 1979. I'll let Irmantas apprise you of the salient details of Soggy's initial run (or should that be swim? ), and summarise here the mirthful monster's reappearances in the toothy funster's comic some 6 years after he originally surfaced. Soggy's Cheeky Weekly episodes commenced with one of the 2 strips from the original run that were drawn by Terry Bave. Like Ringer Dinger, Soggy had appeared in the 1979 Cheeky Annual, but unlike our dog-and-bone wielding pal, the silly sea serpent didn't get an above-strip banner advising readers that they may have seen him before. Whereas Dinger notched up a paltry 3 outings in his Cheeky Weekly reincarnation, Soggy's appearances in the toothy funster's comic amounted to a slightly more respectable 12, with both Dinger and Soggy appearing in the comic's final 2 issues. *It's highly likely that by the time of the commencement of Ringer Dinger's Cheeky Weekly run, the decision had already been made to cancel the comic. 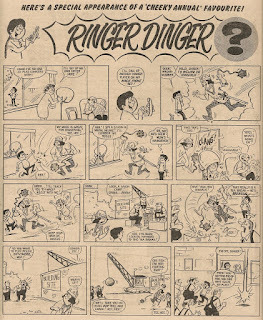 It's therefore possible that, even if Dinger had engendered favourable feedback from his appearance in the previous year's annual, the editor decided that rather than squandering the strips in a comic under sentence of death, he would hold back his stock of RD strips to use in forthcoming Cheeky Annuals and Summer Specials, the publication of which would continue for some years after the weekly comic had folded. Half-page reprints from Buster, Bam Splat and Blooie and Cocky Doodle were used occasionally to represent the animated cartoon portion of the Saturday morning cinema show sequence that featured in Cheeky Weekly's first 59 issues. Strips featuring Warner Brothers characters such as Road Runner and Daffy Duck were most frequently employed to fill the cartoon-representing slot, but the frenetic escapades featuring Bam, Cocky et al (dialogue-free in the manner of Tom and Jerry in the case of BS&B as Peter Gray notes here while providing some examples of their original, colour run) were well-suited to the requirement for animation-like features. The basic cat-vs-bird premise of BS&B was similar to that of the most regular Warner Brothers strip to appear in Cheeky Weekly, Tweety and Sylvester, although Splat's pursuit of Blooie was moderated by Bam, while Tweety survived on his wits alone with no canine intervention. Cocky's adventures were driven by his urge to fill his stomach with whatever foodstuff was on hand. Cocky doodled his way through 5 adventures, while much Bamming, Splatting and Blooieng was in evidence on 9 occasions. On 4 of his 5 appearances, Cocky shared a page with his erstwhile Buster buddies, but in the 31 December 1977 issue our poultry pal found himself on page 27 above an ad for Roy of The Rovers while Bam and associates were placed on the following page beneath an ad for another soccer-related publication, Shoot!. Presumably Cheeky and his cinema-going pals saw these IPC adverts on screen as part of their Saturday morning show. In Cheeky Weekly dated 17 June 1978, two half-page BS&B adventures appeared on page 27, the second being introduced with a caption reading 'And here's a second helping of cartoon fun!' in place of the original title panel. This double portion brought to a close the trio's run in the comic. The final doodle had been cocked for the gluttonous fowl in the edition dated 04 March 1978. 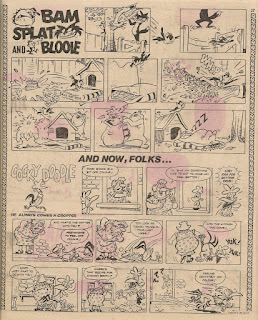 Both Bam Splat and Blooie and Cocky Doodle were written by Ron "Nobby" Clark (significantly as regards the manner of the strips' employment in Cheeky Weekly, Nobby had worked at Gaumont-British Animation studios early in his career), and I suspect the artists on these features were among the Spanish contingent he recruited to work on Buster in its early years.